Welcome to the WikiEqual 2.0 podcast, where we discuss mainstream media bias and its undesirable flow-on effects to our culture and politics, as part of our longer-term effort to challenge the Wikipedia Notability Policy. In this episode, we will discuss the uneven coverage of the candidates running for the Presidency of the United States in 2020. Even at this early stage, more than a dozen candidates are already seriously campaigning, and many of them already have a huge following, including Bernie Sanders, Elizabeth Warren, Kamala Harris, Tulsi Gabbard and Andrew Yang. Wait a minute, who are Tulsi Gabbard and Andrew Yang, you may ask. Regular audiences of my show would already know who they are, and those actively involved in the political scene would know too, but if you relied on mainstream media, you might not have even heard of them yet! To say the mainstream media ignores Gabbard and Yang would be a bit of an exaggeration. They have appeared on shows here and there. But compared to the kind of coverage Sanders, Warren, Harris and O’Rourke have gotten, you would have thought that Gabbard and Yang are perhaps not serious contenders. But this couldn’t be further from the truth! The truth is, Tulsi Gabbard and Andrew Yang are immensely popular at the grassroots level, and their fanbase is growing every day. People are talking about these two on social media, perhaps more than any other candidate. And they are popular for a good reason: Tulsi Gabbard stands for ending unnecessary wars first and foremost, and her message resonates particularly well with Millennials, who came of age around or soon after the disaster that was the 2003 Iraq War. Andrew Yang has the biggest list of interesting policies anyone has seen in a long time, and they are all built around the idea of Human Capitalism, to reform capitalism so it serves humanity. There’s a lot that Yang has put out for discussion, and it is unsurprising that many people have found interest in his ideas. So why do the mainstream media still ignore Gabbard and Yang? Firstly, because they can. Big media is used to being able to control the narrative, to create reality from their perspective. Gabbard and Yang simply don’t fit their story. You know, the story in which America and the West are polarized, identity politics are central to everything, and the Democrats have a huge battle between so-called progressives and centrists. Two candidates who have interesting new perspectives, who take us away from the culture wars and into other discussions, and therefore draw support from former Bernie, Hillary and Trump supporters alike? No, they don’t fit the story, and they need to be ignored as much as possible. And it isn’t even new. Back in 2015, they tried to ignore Bernie Sanders the same way, until it failed. The truth is, big media is a closed shop that likes to live in its own version of reality while trying to censor ideas left, right and center for the rest of us. The big media perspective is always biased, and never to be trusted. That’s all for this edition of WikiEqual 2.0. I’ll be back next time with another story of mainstream media bias. 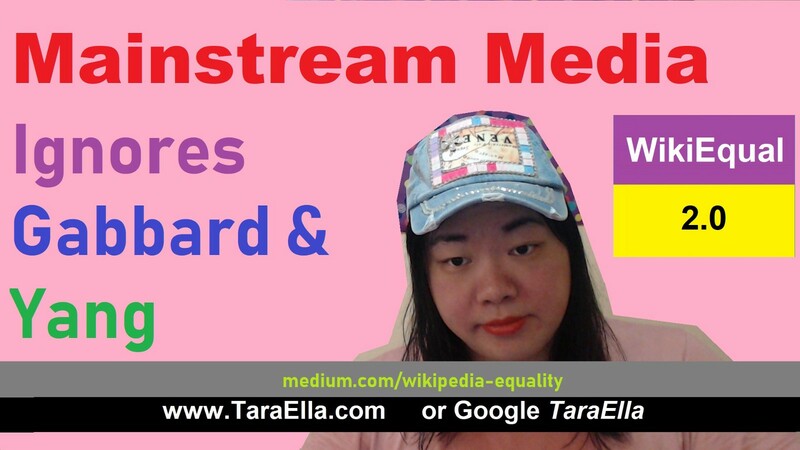 With every story we build our case that the mainstream media unfairly excludes people, opinions and ideas, and ultimately build our case against Wikipedia’s Notability Policy. Until next time, remember to think critically about what you hear from big media. Originally published at taraellastylia.blogspot.com on April 3, 2019.